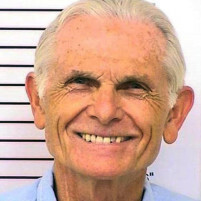 Prison officials have again found Manson family member Bruce Davis eligible for parole from the California Men’s Colony. Davis, 72, has been serving life sentences for two 1969 murders, as well as conspiracy to commit murder. He was not directly involved in the killing of actress Sharon Tate and six others in Los Angeles. The state parole board previously recommended releasing Davis in 2010, 2013 and 2014. Former governor Arnold Schwarzenegger blocked Davis’s release in 2010, and Governor Jerry Brown denied him parole each of the last two years. Brown now has several months to determine again whether Davis is fit for release. While incarcerated, Davis earned a doctoral degree in philosophy of religion and ministered to other inmates. He also married a woman he met through the prison ministry and has a grown daughter. Last year, Brown stated the crimes Davis committed represented a rare circumstance in which the aggravated nature of the crimes was alone sufficient for denying parole. Brown also said Davis’s self-portrayal as a passive bystander in the murders made him unsuitable for parole. PRESIDING COMMISSIONER FERGUSON: Do you think that beheading someone gives you respect? INMATE DAVIS: In that crowd, yes. PRESIDING COMMISSIONER FERGUSON: Now you did stab him; is that right? INMATE DAVIS: I cut him from his armpit to his collarbone. PRESIDING COMMISSIONER FERGUSON: How come you did that? INMATE DAVIS: I was part of his murder. Sounds like a prudent idea to let him go. Yeah Indigo1955, they are too damn busy trying to earn a living to support their own wife and child while Mr. Davis does his “good thing” on our dime. He should have been only allowed to “earn” a strong back from hard labor…not a degree from sitting on his @ss all day while we pay. Guaranteed he won’t have a big student loan to pay back from earning his degree, why because the taxpayers paid for it. We should not have been paying for him all these years, he should have had his life ended long ago. As much as I hate it maybe it is time for the taxpayers to stop paying for him and let him go and make him fend for himself, otherwise as he gets older in prison the taxpayers will be paying for all his medical issues, never mind even out of prison we taxpayers will be paying for him, so keep him locked up until he dies. Try not having children and getting married until you complete that damn thing then. People always like to finger point when it comes to academics. You didn’t do a higher degree because you made the choices in your life that you made, period. How about not being involved in a murder til you complete that damn thing? It’s reassuring to me that we have the local clairvoyant participating here, and that Indigo1955 knows everyone’s circumstances as it relates to college attendance. Not. The Parole Board once again says Manson follower eligible for parole. Also, he’s a model prisoner. So, should he be released, or not just because his name is associated with Charles’s Manson. That’s the 64 thousand dollar question…! Many convicts are released everyday from prison with worse records than his. Earning a doctoral degree in prison and marrying and producing a child are good thing–a lot of people who are free outside never go that far. I believe everyone has the capacity to change—turn their life in a new direction–start over with a clean slate. The only problem with this attitude is there is a lot of vile hatred and a seething revenge mentality in people. Under the right circumstances, everyone is capable of murder. After WWII, the US richly funded (and formed the branch of) social psychology. Everyone wanted to know HOW ON EARTH Hitler had gotten others to obey such heinous orders (some of which involved very painful and gory experiments on human children–making human skin lampshades, putting massive amounts of people to death in ovens, etc.). You will see a lot of people on here that are employed in careers that do not spend years and years studying human behavior. It is very difficult to watch someone make snap decisions online when they have no idea how to conduct a forensic evaluation. I am aware of who did the most recent evaluation on this man. It should be interesting….